Just add butter, powdered sugar and milk to an envelope of drink mix to make this kid-pleasing and colorful KOOL-AID Frosting. Beat ingredients in large bowl with mixer on low speed until blended. 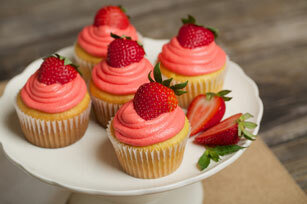 Use to frost the cooled cake or cupcakes as desired, then garnish with fresh strawberries. This easy-to-make recipe makes enough to frost 2 doz. cupcakes or a 13x9-inch cake; or to fill and frost 2 stacked (8- or 9-inch) cake layers. Prepare using 2 Tbsp. of your favorite KOOL-AID Sugar-Sweetened Drink Mix, dissolving it with the milk before mixing with remaining ingredients.